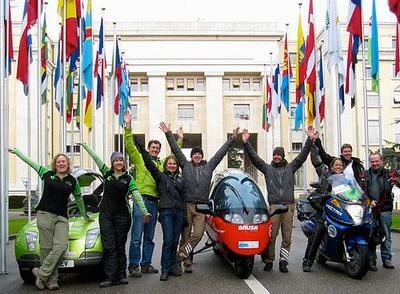 GENEVA, Switzerland, February 24, 2011 (ENS) – Electric vehicle race teams competing in the world’s first Zero Emissions Race crossed the finish line in Geneva today after circumnavigating the globe. Often encountering adverse road and weather conditions, the entire race event took 188 days in total, with stopovers in more than 150 cities, including a celebrated pit stop in December 2010 at the UN Conference on Climate Change in Cancun, Mexico. “This morning, all the three teams set out with a lot of excitement from Le Bourget du Lac, and as they crossed the border of Switzerland, the feeling turned a little nervous as it started to snow! So, on the last day of the Zero Race, the teams drove to Geneva in real winter conditions! But they did well, as they arrived punctually,” wrote Dr. Julianna Priskin, official blogger for the race. Exactly at 11 am, in honor of completing the Zero Emissions Race, the gates of the UN Palace of Nations opened again to let the race vehicles enter as they had opened to start the race on August 16, 2010. Present to welcome the teams from Switzerland, Australia, and Germany were Sergei Ordzhonikidze, director-general of the UN Office in Geneva; Andrey Vasilyev deputy executive secretary of the UN Economic Commission for Europe; and Sylvie Motard of the UN Environment Programme. “The aim was to raise awareness across the world of the alternative low-carbon economy and to foster the use of zero-emission vehicles for people’s mobility,” said Vasilyev. This was not a race of different teams against each other, explained co-ordinator Louis Palmer, the first person to circumnavigate the world in a solar-powered vehicle, the Solartaxi. Instead, the teams were evaluated by a point system on tasks they had to solve with their exhaust-free vehicles. The Oerlikon team from Switzerland finished in first place. “There is only one team, and that’s the Zero Race team. We help each other and do the race together, in sportsmanlike atmosphere, for a greener future,” the Zero Race website states.